This module is a variation on the 1973 Classic Serge Positive Slew module. It is a forerunner to the popular Dual Universal Slope Generator. It is presented here for those who want to build themselves a classic Serge. There are two Positive Slew modules on the PCB. It can be used as both a rising slew rate controller, or a upwards sloping ramp LFO by hooking the lower pulse out into the Start input. In this configuration it also operates as a utility oscillator, suitable for fixed key sequencing and general sound effects and noise making. It is not suitable for tracking a keyboard. Sending a gate or trigger into the START jack will cause the slew generator to lock into a rising waveform, regardless of what is happening at the other inputs, although the ramp is affected by them. The upper PULSE OUT remains on for this period. When the peak of the cycle is reached, both the OUTPUT and upper PULSE OUT outputs reset. Sending a gate into the SUSTAIN jack will will start a cycle, much like above, with one difference. Once the cycle ends, and fore as long as the gate signal remains, the OUTPUT with remain at its peak, and upper PULSE OUT will remain on. The lower PULSE OUT is derived from the analog OUTPUT. It is NOT an inverted version of the upper PULSE OUT. Connecting this output to START or SUSTAIN will cause the Positive Slew to operate as a VCO or LFO. The VC input has a processor style level pot, allowing the response to the incoming control voltage to be tailored to respond directly to the signal, or to respond to it in reverse. If not running a cycle as described above, the OUTPUT will follow any signal at the input, with any rising voltage subject to slewing as set by the RATE pot and any control voltage present at the VC input. The schematic for one half of the dual Positive Slew module. while the bracketed ones are for the other. Any general purpose silicon transistors should work in this circuit. Take care with your connections, as some have reversed pin outs to those shown on the overlay. Traditionally, this design uses an additional 6V power rail. While a pad(Y) is provided, there is no need to connect 6 volts to it, as there is a simple transistor regulator on board. If replacing an existing board in a vintage Serge, you may wish to use the existing 6V rail instead of the onboard regulator. There are no LED drivers provided. If you wish to add LEDs, use some of the modern high brightness LEDs. Connect their cathodes to 0V. Connect their anodes to the corresponding output jacks via 4k7 resistors. There are two 22k resistors used as pulldowns on the sustains input. Using 100k resistors here will bring this input up to modern standards. 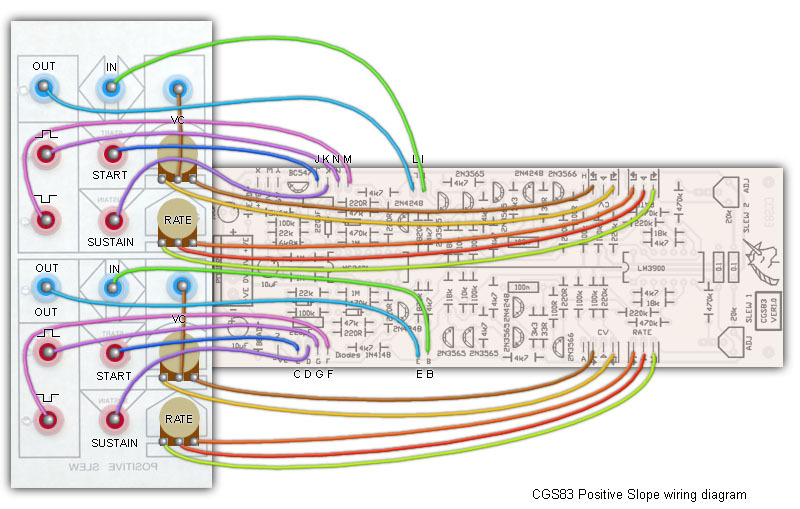 Example wiring for the Positive Slew. Note that the wiper of the VC pots are connected directly to the VC jacks. This negates the need to run four wires to the PCB (A, H and two wiper wires).